This is only a review of the $1 tacos, so it is not a full review of the restaurant or the food. However, Los Tules does a very good $1 beef taco. The best in town? Maybe not, but still good enough for us to go back, often. 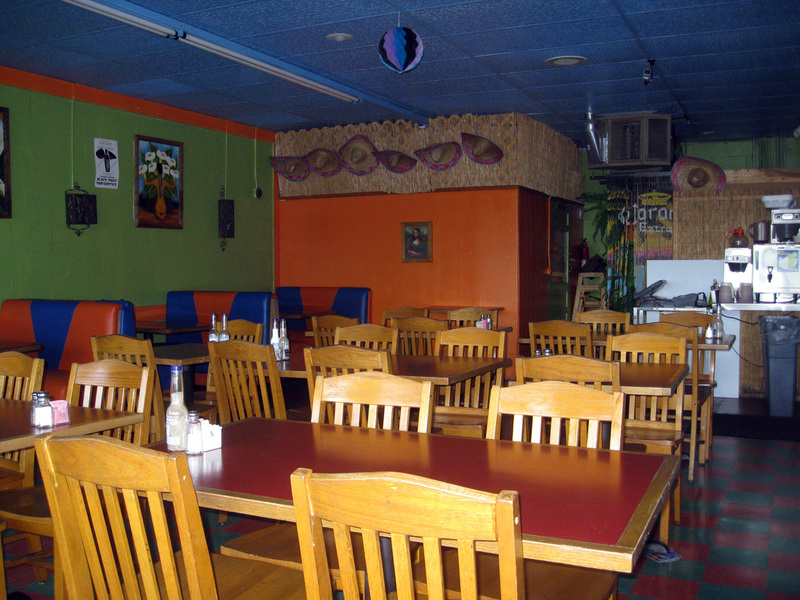 Bright colorful walls, and checkerboard linoleum floors give Los Tules a fun and festive feel, though in general, the restaurant is a little worse for wear. 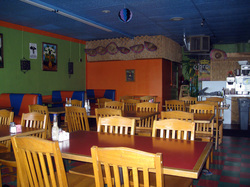 Two large dining rooms make up the inside, one room housing a large bar. There is also an outdoor patio for when the weather is nice, though it overlooks busy Broadway and is noisy. Upbeat Mexican music plays over the speakers. There is a mix of booth and table seating. 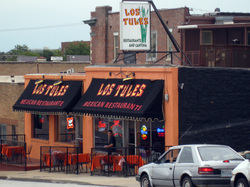 Service at Los Tules is casual and friendly, though sometimes a bit slow. We only go here for the $1 taco specials, so this is not a fair review for the food in general. But, the tacos are available Monday - Thursday 3-7, and are a great bargain. 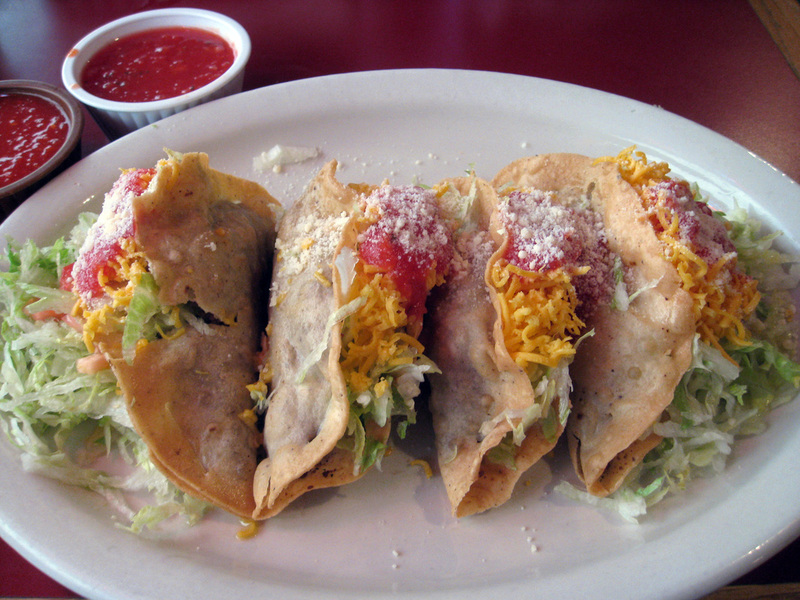 Nicely-sized corn tortillas are stuffed with ground beef and deep fried to order, making hot and crispy little meat pockets. 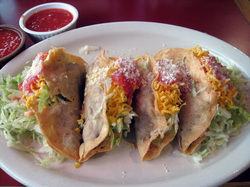 The tacos are then topped with shredded iceburg lettuce, tomatoes, and something that resembles kraft parmesan cheese. I'm not sure exactly what that cheese is, but it gives the otherwise bland tacos a nice salty boost. The crisp-ness of the shells, the hot meat, and the coolness of the lettuce and tomatoes, make a nice plate and, at $1 apiece, it's a great bargain. I can't say these are the best $1 tacos in town, that honor, in my opinion, goes to El Patron, but these are good. Different, but good. I hate to say it, but Los Tules is generally not very clean. The floors are extremely worn and the walls and tables dirty and worn. The bathrooms also leave a lot to be desired. Good tacos at only $1 each. Not the cleanest restaurant, or the best service. Since street parking is not permitted during parts of the day, parking is out of the way after the small driveway fills up.